Have you spotted a non-working disk image? Is there some information or system specs wrong (yes we know there are as it's still incomplete database If you have a little time why not leave a message here so we can correct them faster. Please specify title and what's incorrect and we fix them as fast as possible. High-res compatibility additions. I've tested them all under emulation, except for the two Infocom releases, they're listed elsewhere and there isn't really a good reason for me to suspect they're different than the other Infocom games. And I only checked one version in case there were several country specific ones. Those three above are supposed to run, but I couldn't get a proper display. Version/emulation/user issue? Rings of Medusa: Starbyte's German distributor Bomico said in it's "News" advertising this is supposed to also run on monochrome monitors. All the cracks I tried don't. Transworld: when the version from the site is booted, it says a monochrome version will be released in the short term..
Phantasie II: According to the SSI Forever page, the second Phantasie title is supposed to be compatible as well, but again, didn't find anything with support. For the other stuff we need to find some proof of existence (except the ones not yet in our database). When I have time I also take a look at the suspicious ones and see what we have in our archives about them. An interesting find. Maybe we find one some day. I only had one version of it (Elite) which seems to have the same message. Right, I noticed that about Phantasie II as well, it looked odd. Maybe leave a note about Transworld in the entry, as trivia/wanted? I'm now collecting a few ads and other stuff gathered from mags. The site seems unstable and rather slow these days though, any known problem with the hosting? Hi Troy and sorry for a long silence. I haven't forgotten you, but been rather busy with other things in my life. I'm going to process your ads soon. Haven't noticed any slowdown myself, so can't really say what the problem is Maybe some occasional traffic peak??? No problem. Some of these ads are already on the site, because of the slowness, I couldn't always check. Seems the site is back to normal, haven't had any speed problems when accessing for a while, so maybe really just traffic related. 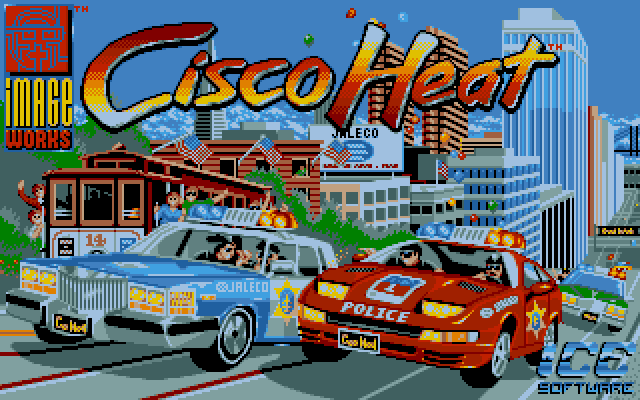 Why does the first Cisco Heat screenshot (loading screen) miss the "TM", red text and should be seen next to the title logo? Is the screenshot altered before added to Atarimania? Interesting.. No, they are not altered unless our only source is versions from compact disks or other hacked disks. Menucrews and crackers in the past had a habit of altering title screens with their own messages etc. So in these cases we have cleaned their "cracked by..." labels from title screens and used the best we could. In some cases it's very hard to say if the cleaning process went ok, especially on rare titles where we have no original to check it. In some cases title screens are bit different between releaseversions. I need to investigate this more to give you a precise answer. I have also checked the PC DOS version and the screenshot that can be found at Mobygames does not have the "TM" text... actually so is the windows bigger of the building so the TM text will not even fit. Another thing about CH screenshot so does it contain more than 16 colours... i used irfanview's "Image - information" option and it says it has 52 unique colours, so something was defenitly modified in the pic, something similar is applied to "Prince of the Yolkfolk" screenshots: http://www.atarimania.com/game-atari-st ... 10297.html Like the title pic has 256 colours... it can actually be seen as an vauge anti aliasing, and i have no idea why it was added? Do you want me to help adding screenshots to AM? I can do it unless it is too difficult? The Robocop 3 entry is showing the ad for Epic. Alan Grier says in the following interview that he is the one behind the name "Freddy"... as seen credited in Turbo Outrun and other games. He also did graphics for 1943 and Road Blasters.